Calling all graduates! It’s that time of year again when exams are finally over, and you can start to relax and enjoy the Summer. For those of you who are graduating, or have a loved one who is, you must celebrate the occasion in style, after all, it is an incredible achievement! As you may already know, our favourite charm collections, Nomination and Thomas Sabo, have a charm for every occasion imaginable, and graduation is no different! We recommend the mortarboard or diploma form Nomination, or champagne bottle or mortarboard from Thomas Sabo! Trollbeads even have a special charm to commemorate your graduation! So congratulations to all the graduates out there this Summer – good luck! Race for Life Solihull is this Sunday! Good luck to all of you who are taking part in Race for Life this Sunday in Solihull! This will be the first time we have done the race in Solihull, and we’ve got over 40 customers signed up to run with team fabulous! We’re hoping to raise £2000 for Cancer Research UK, our biggest fundraising target yet, but we’re confident that with running 3 races, one for each shop (Milton Keynes, Solihull and Leamington Spa) that we will achieve this. We’ll be celebrating the end of the race with a glass of pink bubbly, to say ‘well done’ to us all! It’s the last week of the month again, and at fabulous Last Chance, our brand new designer jewellery outlet store, that means more reductions on a big designer name! This week, we’ve got the Italian collection, Antica Murrina Venezia, on special offer, with up to 60% off last seasons items! Antica Murrina Jewellery is absolutely stunning, with each piece being made from Murano glass. Expect to see an array of colours, with most items being made up of several colours for a bold and fun look – great for Summer. It’s Father’s Day today so we hope you’ve all treated your fab Dad to something very special! We’ve been surprised with the growing trend in men’s jewellery – we’ve always thought it was great, and are thrilled to see men actually asking for jewellery for occasions such as Father’s Day. It’s official – men are starting to get stylish! Our biggest hits for Father’s Day this year were the Big Nomination Bracelets – chunkier than the classic version of this Italian charm bracelet, making it more suitable for a mans wrist. Also, the new Fred Bennett collection, exclusive to our Milton Keynes store and our website, has also proved very popular. Have you been watching the World Cup? At fabulous. we’ve been waiting for the World Cup to start so we can start wearing our favourite football themed jewellery to show our support! 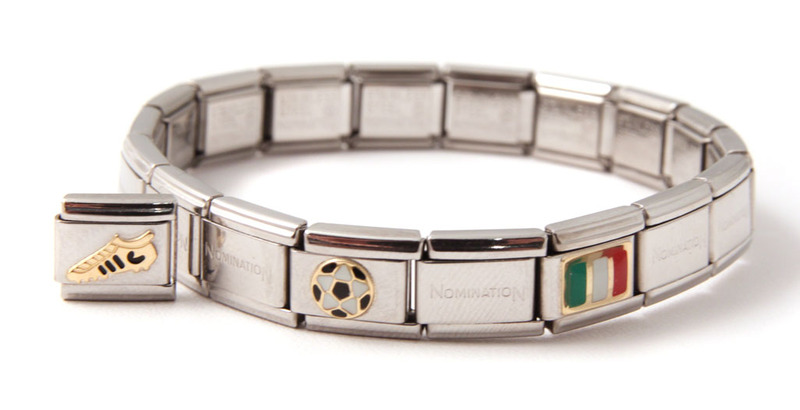 One of our favourite ways to support our country this World Cup is with a Nomination World Cup Bracelet, which comes with a flag of your choice and football boot, or football for only £35, instead of £44! Midsummer sale now on at fabulous! Our Midsummer sale is now on, and we’ve got great designer jewellery reduced up to 70% on some collections. Featured designers in our sale this year include Missoma, Antica Murrina Venezia, Spinning Rings, Lola Rose and Dower and Hall. Also, if you are shopping the sale this week, don’t forget that you receive an extra 10% off sale prices this week. Use the code SALE10 when you get to the checkout to get your extra 10% off! This offer ends on Sunday so just a few days to go! Which is your favourite Fairytale character? We are very excited this week as Nomination have sent us their brand new range, Fantasia. These new links are filled with characters from the tales of Alice and Wonderland, Peter Pan, and many other fairytale characters – a Prince, Princess, Unicorn, Mermaid – there’s even a frog prince! Nomination’s previous collection, ‘Peace and Love’, with hippy-themed links was an absolute hit with our customers (and staff) so we’re all very excited to see these new charms!